How much would it cost to develop Chatbot System for food delivery platform? According to Juniper Research 2017, AI powered Chatbots have potential to save businesses up to $7.6 million per year across industries. Chatbot, in layman’s terms, is a computer program designed to simulate human conversation. It is a service based on artificial intelligence, that interacts with users. Smart companies are saving their resources and money by using chatbots to do basic first level interaction with customers. Let’s Nurture helps in developing powerful Chatbots for businesses which will gift them having a robust, smart, reliable and efficient flow of process. Revolutionary AI Chatbots are powerful with a vast knowledge to be efficiently performed while having a conversation. Chatbots avoids a glaring issue in making visitors or users wait by providing instant replies. Messenger data can be utilized for analysis which saves time and money being spent on different tools and platforms. AI powered Chatbots can also perform actions if programed to do so. For example, a Chatbot implemented on a Food ordering and delivery marketplace platform providing a list of nearby restaurant upon a demand “Nearby restaurants”. Chatbot gives unique interactive experiences on major platforms increasing chances of high retention rates. Online food ordering and delivery marketplace like UberEats, Grubhub, Zomato, Swiggy etc. attracts all the food business owners to leverage their platform. Not because of their platform popularity, but because of the changing taste and needs of the humans of today. Now, everyone can have their order on the tables, anytime and anywhere, thanks to on demand marketplace platform development. Read here: Know more on how an online food delivery platform like UberEats works and its development cost? Messenger Chatbot will give you a complete and exact information in the best way possible. The information will be subtle and reliable while experience being amicable. If you are wondering about how much would it cost to develop a Chatbot for food delivery platform, then please take a note that chatbot development cost would be around $3.5k-5k. How Let’s Nurture can help with Chatbot Development for food delivery platform? Chatbot developers at Let’s Nurture are always looking forward to enhance business operations while giving value to the overall business goals. Our quality driven chatbot development process offers a complete package to develop innovative chatbot solutions for Facebook, Twitter, Slack, Kik, Microsoft and so on. Our chatbot builders create high quality automated assistants which are implemented to an array of industries including online food ordering and delivery marketplace. 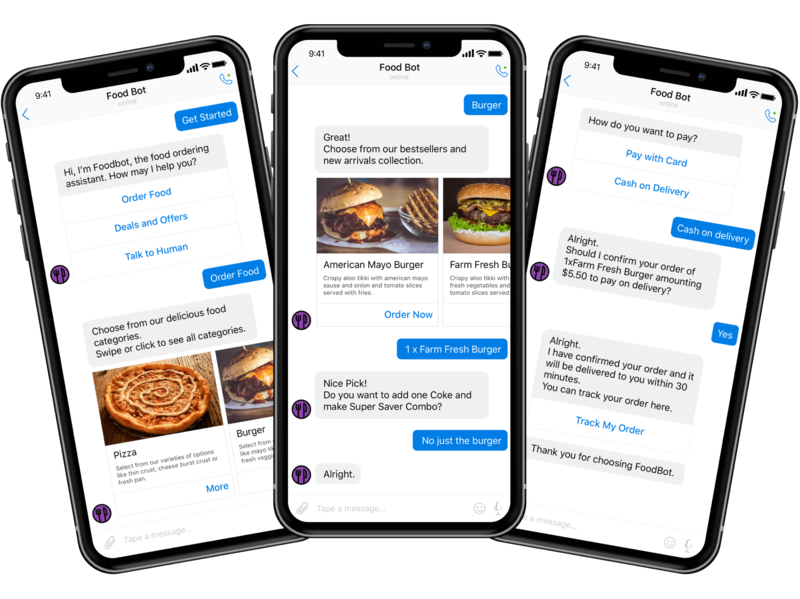 If you feel it is TIME to step up to achieve or expand the boundaries for your food delivery platform leveraging Chatbot development, then what are you waiting for? Can I integrate Chatbot with existing online food delivery app? We are a leading Chatbot development company in Ahmedabad, India where our in-house Chatbot developers can build Chatbot SDKs which can be easily implemented with new and existing web and mobile applications. Can Chatbots automatically learn questions asked by users of online food delivery? Yes, it can. By using Machine Learning (ML) techniques, bots can be created in such a way that they learn by themselves. Do I require separate server to host chatbot? It is not mandatory to host the Chatbot on a separate server. We can develop and integrate the Chatbot to the same server that runs web or mobile app for online food delivery. 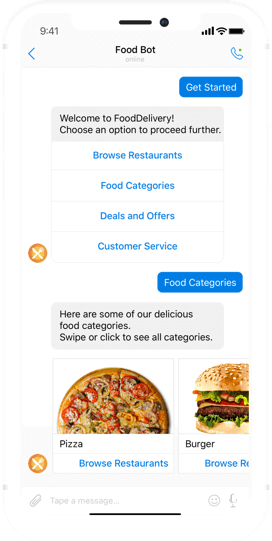 Which type of Chatbot should be integrated with online food delivery application? 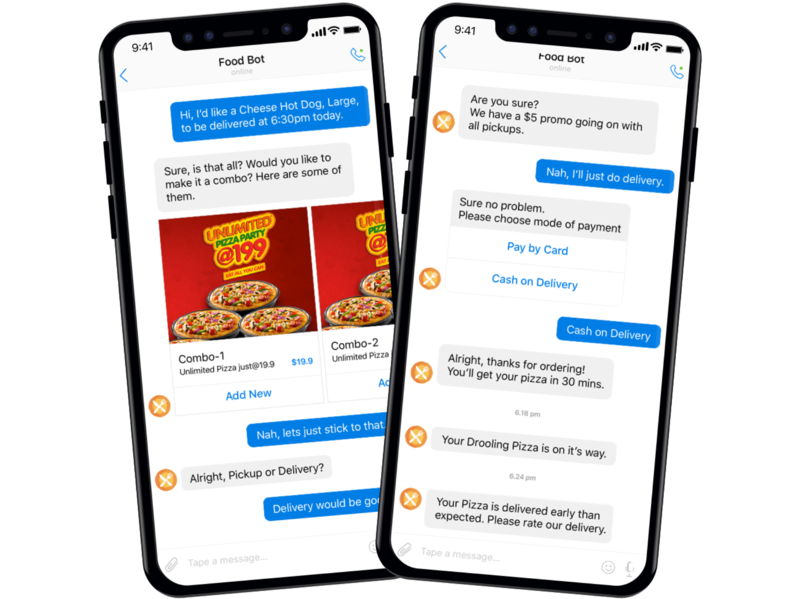 Converational and flow based Chatbots can be built and integrated with online food delivery platform. Is there any facility to export the chat happened between bots and users for online food delivery platform? Yes, we can provide a feature that will allow you to download the chat transcripts in .csv, .txt formats. We can also provide our own analysis on data visualization platform based on user-bot conversations. Is there any way to identify user location? It is absolutely possible to identify the user locations. Chatbots can derive the user location through IP address. Should project booking require full payment in advance? This is to be decided based on region specific industry best practices. Ideally, we recommend 50% advance and 50% escrow to be released after satisfactory level services verified by customer. Can you provide option to hire dedicated Chatbot developers for my online food delivery? Yes, we do provide flexible hiring models consisting highly skilled and certified resources (Chatbot developers, web developers, Android app developers, iOS developers) which are well versed in mobile app development projects for diverse industries using latest and cutting edge technologies. Have an !dea or need help with your Chatbot System for food delivery platform?